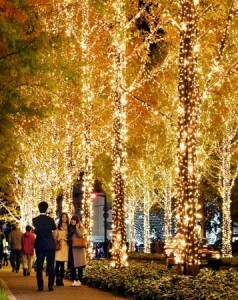 Illuminations of street trees with approximately 800,000 light bulbs began on the night of November 24, in an area around the head office of ROHM Co., Ltd., a semiconductor maker in Ukyo Ward, Kyoto. Many families and couples strolled along the sparkling, tree-lined streets. Every winter, RHOM holds the illumination event with one of the largest number of decorative illuminations in Kyoto City. Although the event was suspended for three years after the Great East Japan Earthquake in 2011 due to power shortages in winter and other reasons, it was resumed from the winter of 2014. 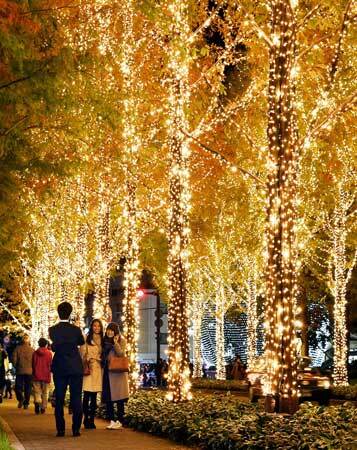 A total of 82 trees, including metasequoia, zelkova and others, around the head office were decorated with light bulbs and LEDs, or light-emitting diodes. Visiting citizens walked around, looking up at the glittering trees. There was a brass band performance by the RHOM's employees, and the event site was filled with warm light and sound. A housewife from the neighborhood said, "When the light-up begins, I feel the Christmas spirit," as she enjoyed taking photos. It will be illuminated from 4:45 p.m. to 10:00 p.m. every day until December 25. On Saturdays, Sundays and holidays during that period, there will be a cappella concerts by students and other events.